Muddy fun raising funds - Aquamoves – Indoor and outdoor pools, fitness facilities and programs in Shepparton, Victoria. This year’s Mad Cow Mud Run is set to be better than ever with more obstacles, more mud and more fun. Nate Sutherland, Molly Gerada, Ellie Chadwick, Jake Chadwick, Mad Cow, Ty Sutherland, Zac Chadwick and Geoff Cobbledick are ready for this year’s bigger, better and far more muddier Mad Cow Mud run. The 13 km adult course kicks off from SPC KidsTown on Saturday, March 11. Picture taken by Julie Mercer. Muddy: Erin Saunders gets down and dirty last year. 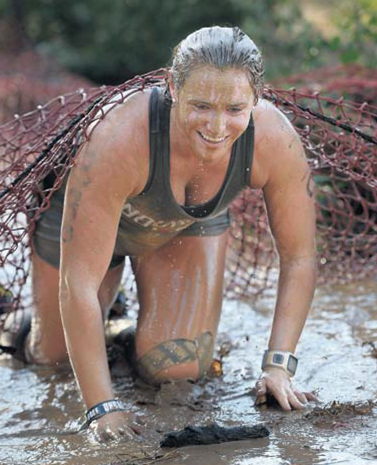 In its fifth year, the Mad Cow Mud Run involves a 3 km children’s obstacle course and 12 km adults obstacle course. The event fundraises money for the Give Me Five For Kids campaign, which supports Goulburn Valley Health’s children’s ward. One of the event organisers Geoff Cobbledick said the run started out as a small group of volunteers including Jarrod Sutherland and Gary Gerada, who recognised an opportunity for an obstacle course in Shepparton. ‘‘The objective is three-fold, the first one is to put on a fun event that encourages people to get into physical exercise,’’ Mr Cobbledick said. ‘‘We’re also looking to have an event that generates income for the Shepparton community. ‘‘We would expect to have 1000 entries in the adults and 1000 in the kids event, so there’s a whole range of associated benefits then with accommodation, meals and all the purchases we make for expenses on the event, we make locally. Mr Cobbledick said over time the event had grown to a committee of 13 volunteers and benefited the many community groups and teams involved in the presentation of the event, including Kiwanis, Shepparton Swans Football Club and the CFA. This year, adult competitors will scale 30 obstacles across the 13 km course, which will kick off at 7.30 am on Saturday, March 11, at KidsTown. Many fan-favourite obstacles will be back this year, with the addition of some new obstacles including much more mud. ‘‘So this year we’re starting and finishing at KidsTown which means we’ll be incorporating some new territory in the course so there will be a combination of old and new course,’’Mr Cobbledick said. Event organisers work hard to create a safe yet challenging course for participants. 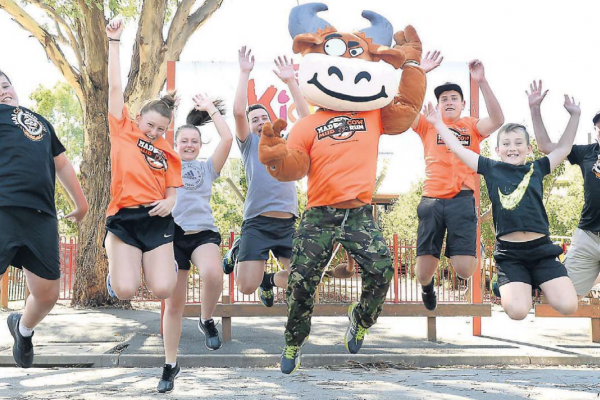 Since its inception, the Mad Cow Mud Run has raised almost $100 000 for the Give Me Five For Kids campaign and this year event organisers hope the accumulative tally will reach the six-figure mark. ‘‘To date we’ve raised $95 000 for Give Me Five For Kids so obviously we’re hoping to add significantly to that in 2017,’’ Mr Cobbledick said. Article curtesy of The Shepparton News from 22 February 2017. Written by Taylah Burrows.